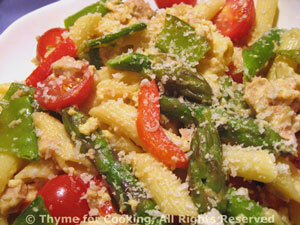 Pasta Primavera with Tuna, Thyme for Cooking easy one dish dinner. I've made this Primavera' a little more 'spring-like', added some tuna to make it a full main course rather than just a hearty side dish and finished it with a light egg/Parmesan sauce. Trim snow peas and cut into half or thirds, diagonally. Add asparagus and boil for 2 minutes (3 for white). Heat oil in a nonstick skillet over medium heat. Add red pepper and sauté 2 minutes. Add asparagus and snow peas and saute 5 minutes or until vegetables are lightly browned. Add tuna, breaking it into large chunks. Keep hot. In medium bowl whisk egg well. Add 1/2 cup Parmesan and whisk. Immediately put pasta into skillet with vegetables and toss well. Slowly pour 1 tbs of hot pasta water into egg mixture, whisking. Pour egg mixture over pasta, tossing well. (Use tongs). Toss in skillet 1 minute, to heat through, then quickly put into a serving dish. Add tomatoes, herbs, toss to combine and serve, remaining 1/4 cup Parmesan on the side.